Peanut Butter Pie With Oreo Crust Recipe - The Perfect Dessert Pie! As we continue our November recipe theme for Thanksgiving, a little warning, this one might just become your year round favorite! Not only is it easy to make, but it is sinfully delicious! 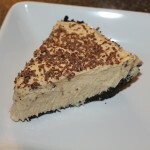 Peanut Butter Pie –a family favorite! I have to admit, I am a peanut butter fanatic. It all began my Kindergarten year when I would beg the school bus driver to hurry and get me home so that I could eat my after school peanut butter and jelly sandwich. No wonder why I became known as the “peanut butter kid”. Honestly, I could eat peanut butter on EVERYTHING!!! I eat it on bananas, apples, crackers, and don’t forget the sandwiches – the “Classic”(peanut butter and jelly), the “Pregnancy craver” (peanut butter and bacon), and the down right “Weird” (peanut butter, mayo, and pickles). So I had to find a way to incorporate peanut butter into my favorite meal of the year….Thanksgiving. Since I have to be somewhat traditional, putting peanut butter in the cranberries was out of the question. 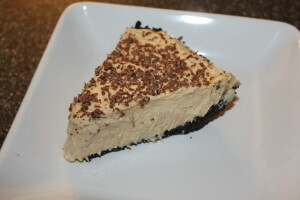 But since not everyone loves pumpkin pie, it has become tradition that I also make Peanut Butter Pie. Believe me, there isn’t a crumb left over at the end of the day. **Yes, you can buy a pre-made Oreo crust that will work just fine. Crush Oreos into a fine crumble mixture – If you have a food processor use this — it will save you a lot of time and clean up later. Don’t worry, the cream filling will just disappear. Pour melted butter over the top and stir with a fork to combine. Press into pie pan and bake at 350 degrees for 5 to 7 minutes. Beat the peanut butter with room temperature cream cheese until smooth. Add powdered sugar and beat until smooth. Add in the thawed Cool Whip and beat the mixture on high for 1 minute, scrape the sides, and beat on high again until smooth and fluffy. Pour filling into crust, evening out the top with a knife or spatula. 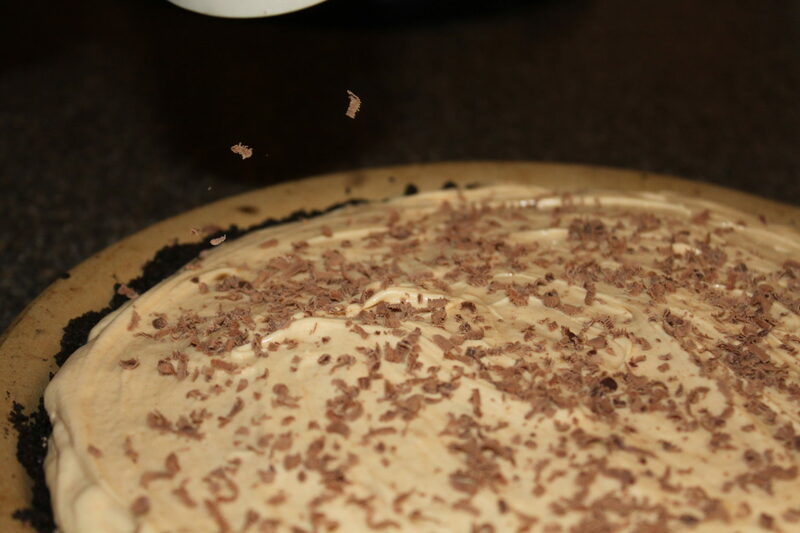 Optional – top with mini chocolate chips or chocolate shavings. Chill for at least an hour before serving. Warning: This pie is ultra-rich. Cut small slices—your guests will thank you! **Yes you can buy a pre-made Oreo crust that will work just fine. Crush Oreos into a fine crumble mixture - If you have a food processor use this -- it will save you a lot of time and clean up later. Don't worry, the cream filling will just disappear. Pour melted butter over the top and stir with a fork to combine. Press into pie pan and bake at 350 degrees for 5 to 7 minutes. Optional - top with mini chocolate chips or chocolate shavings. Chill for at least an hour before serving.